Newt Gingrich, the latest frontrunner in the 2012 GOP presidential field has wasted little time in testing his appeal for the party's social conservative base, with comments in Tuesday night's CNN debate in favor of a more "humane" approach to enforcing immigration law. 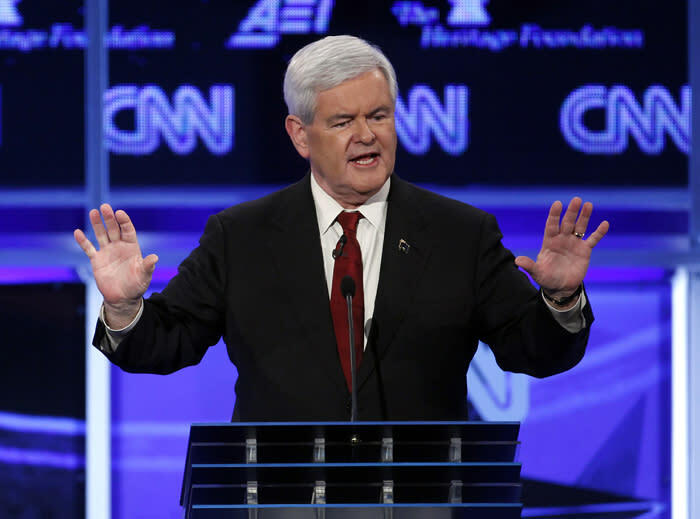 In the forum--a national-security debate that the cable network cosponsored with conservative think tanks Heritage Foundation and the American Enterprise Institute--Gingrich argued to extend the basic protections of citizenship to the families of otherwise law-abiding illegal immigrants. Gingrich—who advocates the Vernon K. Krieble Foundation's immigration proposal to create "red card" work permits-- said he does support deporting recent illegal immigrants. But he did disown a hardline policy of seeking out and punishing children of illegal immigrants, including those who wish to serve in the U.S. military. As rival candidate Michele Bachmann was quick to point out, Gingrich's position shares many affinities with the DREAM Act proposal defeated in Congress last year. And Bachmann, together with other conservative candidates on the dais, called out Gingrich for backing a version of amnesty for the families of people who entered the United States illegally. In a follow-up exchange on the issue, former Massachusetts Gov. Mitt Romney said he agreed with Gingrich that foreign students with masters degrees should be encouraged to remain in this country via green cards. But Romney also stressed that he agreed with moderater Wolf Blitzer's suggestion that Gingrich's policies would entice more illegal immigrants to come to America. The fledgling 2012 campaign has already seen one early frontrunner stumble on the thorny immigration question. In September, Texas Gov. Rick Perry--who had enjoyed a strong initial run in the polls after he announced his presidential candidacy--tried to make a similar case for a less hardline immigration policy during a debate in Orlando, Fla. Correction 7:49 a.m. ET: A previous version of this story stated that Mitt Romney offered support for illegal immigrants with masters degrees to remain in the United States. Romney offered support for foreign students with masters degrees. Laura Rozen contributed to this story.